Park City Mountain will present a full line up of holiday events and activities this December. Santa Comes Down Town Lift on Saturday, Dec. 15. The 16-Day Snowfest Celebration kicks off on Saturday, Dec. 22. PARK CITY, Utah – Nov. 27, 2018 – Park City Mountain is now open for the 2018-19 season and preparing to celebrate a magical holiday season. As snow blankets the trails this December, Park City Mountain will celebrate the holidays with events and activities for the entire family. The resort is even expecting a special visit from the man himself on Saturday, Dec. 15. That’s right, Santa Claus is coming to town (to ski!). Find a full lineup of holiday activities and events below. Santa Claus is coming to town on December 15. Santa loves Park City and he has been visiting the town on this day for many years. He especially loves riding down Park City’s Historic Town Lift to Main Street to meet the kids and spread holiday cheer (and his reindeer appreciate a night off). Beginning at 5:30 p.m., visitors can await Santa’s arrival in the Town Lift Plaza and enjoy complimentary cookies and hot chocolate. Santa will arrive in the plaza around 6 p.m. to meet and greet with the children and families following his trip down Town Lift. Photo. Park City Mountain will celebrate the holiday season with Snowfest: a 16-day winter festival featuring après ski events, musical acts, village entertainers, and activities including ice sculptures, s’mores roasting, meet-and-greets with the avalanche dogs and more. Activities will be presented at both the Park City Mountain Village and Canyons Village every single day. Be sure to keep your eyes peeled for Santa all Snowfest long. The jolly old elf is a known fan of the mountain and can be found visiting with guests leading up to Christmas Day. 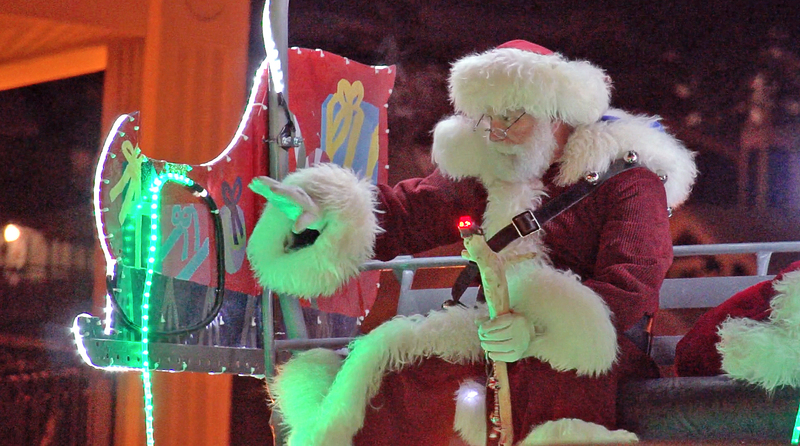 Park City's Annual Christmas Eve Torchlight Parade is a tradition as old as the resort itself. On Christmas Eve, over one hundred Park City Ski and Snowboard Instructors will ski down the mountain with lit torches creating a beautiful scene on the Mountain. They will be joined by Santa Claus skiing down at the end. This is one of Park City’s most special and longest-running traditions and creates a special seasonal atmosphere on Christmas Eve. The celebration will begin at 5:30 p.m. in Park City Mountain Village with holiday music and cheer followed by the Torchlight Parade at approximately 6:00 p.m. If you’re looking for a way to celebrate the New Year and want to start the night off with a bang, Canyons Village has just what you need with music and a spectacular fireworks display! Park City's New Year's Eve Celebration is a great way for you and all of your friends and family to kick-off your New Year's Eve celebrations. In addition to the fireworks show, enjoy fire pits, hot cocoa, and live music at the Canyons Village. In addition to the holiday activities detailed above, Park City Mountain will host live music, events and activities for guests throughout the entire winter season including the 16-day Spring Grüv festival in the Spring. For details on events and lodging and updates on terrain and weather reports, visit ParkCityMountain.com.